Until I started blogging I didn't realize that it took more than a blogging platform and a camera to run and maintain a blog. 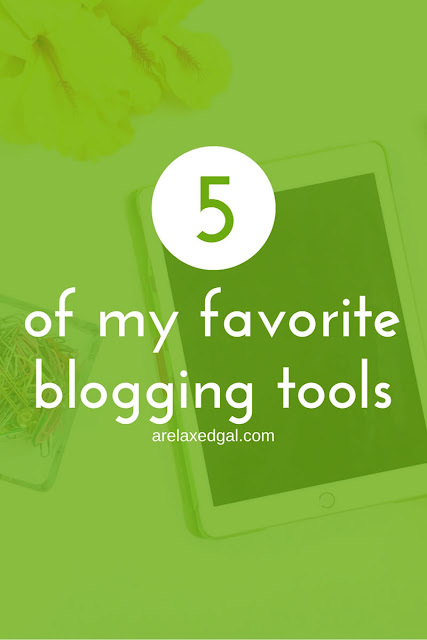 Blogging not only takes commitment, but it takes a village, a village of blogging tools. Tools to help you promote your blog, edit images, write posts and create graphics. Over time I've found and tried several tools to help me do all of that, but a few have risen to the top and made my favorite list. Pinterest is one of my largest traffic drivers so I like to make sure I’m constantly pinning quality content to draw in more followers and readers. Since I have a full-time job I don’t have time to manually pin so I enlisted the help of Tailwind. With Tailwind I'm able to easily and quickly schedule pins for my boards and group boards several days in advance. Tailwind also provides me robust analytics on which boards and pins are performing best for me. There is a cost for Tailwind, but it’s so worth it. I’m signed up for the annual Tailwind Plus plan which breaks down to $9.99/mo. You can try Tailwind with a free trial by using my affiliate link. Right now I’m taking all my pictures using my iPhone and photography isn’t something that comes naturally to me. So I need a good photo editing app. I’ve tried several of them, but haven’t found one that’s as easy to use or edits as well as SnapSeed does. With Snapseed I can crop, straighten and edit my photos. There are also filters I can add and an option for adding text. While I’m a person with creative tendencies, I don’t have a designers eye which is why Canva is such a huge help. Canva is an online graphic design software that makes graphic design easy for non-designers. I currently use the free option which allows me to create designs for social media covers, blog graphics, posters and more. I love how simple it is and that I can use my own images or free ones available through Canva. To manage my email subscribers and send emails I decided to use MailerLite because it fits my budget while providing the types of features I want and need. Using the free MailerLite plan I can set up multiple subscriber lists and send different emails to each one. I can also set up automation workflows for each subscriber list. I haven't found another email tool that lets me do that. I love how easy the interface is to use and the reporting that I get. MailerLite's free plan allows you to have up to 1,000 subscribers. If you outgrow that paid plans start at only $10/mo. I use Google Docs at work, but hadn’t really thought about using it for helping me to manage my blogging. The great thing about Google Docs is it’s free. All you need is a Gmail account. I’ve started using Google Docs to write and organize my posts before putting them into my blogging platform and editing them. This allows me to easily edit them and not have to worry about that so much within the blog platform. Additionally I use Google Sheets for tracking my blog and social media stats. In the sheet I added formulas to help me calculate the month-over-month changes and monthly averages that I share in my traffic reports. I haven’t done this yet, but I also have the ability to create graphs to visually display how my blog is doing.